Amid Political Change, globalFEST Reaffirms Its Mission In 2017 A one-night festival in New York called globalFEST is a passport to explore compelling artists from five continents. But this year's event came at a moment particularly fraught by politics. Sudanese-American singer Alsarah brought her band, The Nubatones, to globalFEST this past Sunday in New York City. The world music festival globalFEST, held every year in New York, is regarded as a snapshot of rising acts in international music. It's also quite a scene: Music industry professionals make up a large portion of the crowd, and they're all there to scope out which acts from Africa, Asia, South America, Europe and beyond might just be hot in the next couple of years. NPR Music's Anastasia Tsioulcas was at the festival Sunday, and she joined NPR's Steve Inskeep for a wide-ranging conversation about the artists she saw, the history of the event and what world music means in the current political moment. Hear their full conversation at the audio link and read on for an edited transcript. Steve Inskeep: So who is this person we're listening to? Anastasia Tsioulcas: This is a singer from Venezuela named Betsayda Machado and her band, which is called La Parranda El Clavo. There's a lot of African sound in her music, a lot of textures, a lot of rhythms. She comes from a community of descendants of former slaves, and they have managed, in their tiny town of El Clavo, to hold on to their African traditions and their music. And now here they are, touring the world. So we're talking here not just about musical acts from different places, but maybe a single act that draws on music from different places. What is this festival like? Where is it, exactly, and who shows up? This is in New York City every January. It is one night at a club called Webster Hall — three floors, three different mini-venues, all in the same building. So you've got a couple thousand people running up and down the stairs all night to hear all of these acts and weigh in. There's a lot of civilians, but there's a significant chunk of the audience who are music industry people — club bookers and artist managers and labels — and they're chasing the next hot thing. Do you mean literally running up and down the stairs? Like, are your knees sore now? Oh yeah. There's fully training, granola bars, gel packs to get through the evening. Where did this festival come from? It was founded back in 2003 by a trio of very influential bookers in New York City. They saw in the post-9/11 era a real opportunity — and real reason — to create a gateway for the music community to book and tour international artists, because it became very hard in those years for those artists to get visas to perform in the United States. The bookers thought they could create something as a reaction to what they perceived as increasing xenophobia in the United States. So this has always been somewhat political in nature. Are there any acts that seem particularly timely — that speak to our current moment? There are certainly always artists that want to talk about the politics of their region or of their background. To me, one of the most resonant acts this year was a band from Cuba called Septeto Santiaguero. This is a big dance band from this city on the southeastern tip of the island called Santiago de Cuba. There's nothing political about their music — this is music to party to — but right now, it feels very hard, when we're just at the brink of a shift in administrations in the United States and potentially a huge shift in policy towards Cuba. You know, this openness that we've had in the past several years — who knows what's going to happen next. And we should emphasize we do not know what policy President-elect Trump might follow toward Cuba, but he has spoken about a conflict between globalism and nationalism. Where does a music event called globalFEST fit into that discussion? Well, it's interesting because we can look at this in terms of strictly music. You know, a lot of the artists who appear there are very much artists of 2017. You're hearing hip-hop, you're hearing punk, you're hearing R&B. You're hearing all these things that make music go right now — plus tradition: acoustic instruments and very ancient ideas and modes and rhythms melded together. But also, I think we're going to see the same kind of concerns that the founders of this festival were thinking about back in the early 2000s: Is it going to be harder for artists coming from Africa or South Asia or the Middle East to get a toehold in the United States in the years to come? Is this going to be a place where people are going to be open to sounds from around the world, or are they really going to be very settled in music from here? Were there American artists at globalFEST? There always are. It's really interesting to me — in the past several years, the bookers of globalFEST have tried to emphasize American regional music, so, for example, there was a Gullah group from South Carolina. But there were also musicians who draw on their own ethnic backgrounds and traditions — one of those was an artist who was born and raised in Sudan named Alsarah, but, go figure — she's in Brooklyn now. 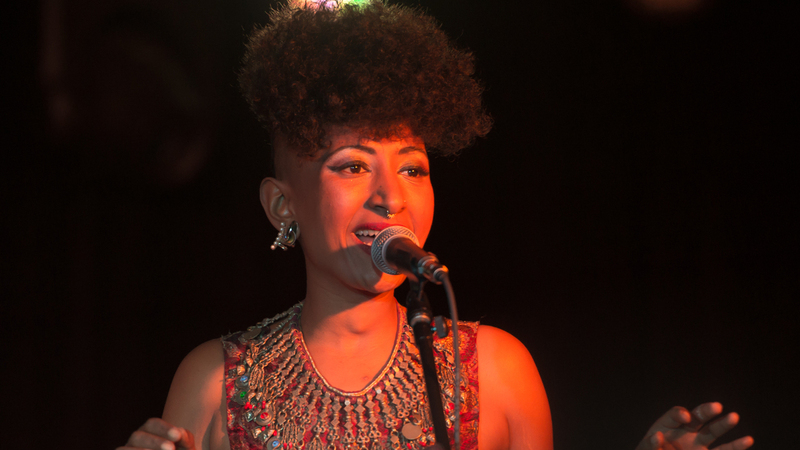 And she creates a kind of music that she likes to call "Sudanese-Nubian retro-pop." OK, so two different cultures of Africa being drawn on from Brooklyn. She is a Sudanese artist, so she sings in Arabic, and of course there's the sort of pan-Arabic musical tradition — but also a very sub-Saharan-influenced style that makes it really Nubian and really very much of black Africa. Are we hearing in music a bit of a contradiction here? There are a lot of people in this country who are concerned about America's relation with the wider world, but we're, in effect, the global nation that has drawn people from everywhere already. Yeah, absolutely. How do you honor both of those instincts musically? How do you preserve and nurture regional American traditions that came through the soil — and also, for artists who really are coming from everywhere and call America their home, how do you be of this place, and of this time right now, and also honor the place that your ancestors came from or that you've come from?